He further charged that the press "loses its objectivity when it begins to address the issues of Abu Ghraib and the emotion that is drawn out by those photographs. We lose, we lose and abandon the journalistic oath of fair and objective." 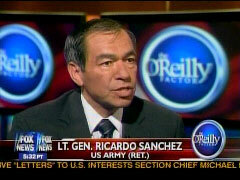 As previously reported by NewsBusters, when Sanchez in October 2007 gave a speech in which he criticized Bush administration leadership but also found fault with news coverage of Iraq, the mainstream media ignored his criticism of the media while playing up his criticism of the administration. Sanchez also insisted that under his command, the military "aggressively investigated" allegations of misconduct by U.S. troops. He also tried to put into perspective that such "mistakes" occur in every war. Sanchez: "One of the key things is that we have always made mistakes during wartime. And, in this war, it was no different. ... Whenever an abuse is identified, we very aggressively investigate it, and we actually court-martial soldiers and convict them and send them to prison." And he contended that the U.S. military in Iraq is "in compliance with the Geneva Convention." The former commander also expressed his view that a "precipitous" withdrawal of troops would "put the entire region at risk." Sanchez: "Pulling out of there unilaterally and precipitously will, in fact, create a significant national vulnerability and probably will put the entire region at risk. I don't believe that we can afford to do that. I believe we have a responsibility, having gone into that country and changed that regime." LAURA INGRAHAM: And in the "Personal Story" segment tonight, war stories. The former commander of the Coalition Forces in Iraq says the liberal media hyped up the Abu Ghraib controversy to destroy American credibility. Lieutenant General Ricardo Sanchez has a new book out called Wiser in Battle: A Soldier's Story. He recently sat down with Bill. BILL O'REILLY: General, when you saw the press in America go wild over Abu Ghraib – 50 front-page stories in the New York Times alone -- and you're over there in Iraq commanding forces, what was going through your mind? LIEUTENANT GENERAL RICARDO SANCHEZ, FORMER COMMANDER OF COALITION FORCES IN IRAQ: Well, Bill, one of the key things is that we have always made mistakes during wartime. And, in this war, it was no different. We actually have mistakes that are made. Abuses do occur. But investigations are being conducted from the very first day we launch our offensive operations into Iraq. There are multiple investigations -- tens, twenties, probably 100 investigations that we conduct over the course of the time that I am in command. Whenever an abuse is identified, we very aggressively investigate it, and we actually court-martial soldiers and convict them and send them to prison. O'REILLY: But it wasn't good enough for the press, was it? SANCHEZ: No. Because what happens is we get totally mesmerized by the photos. And the press, in fact, loses its objectivity when it begins to address the issues of Abu Ghraib and the emotion that is drawn out by those photographs. We lose, we lose and abandon the journalistic oath of fair and objective. O'REILLY: But that's been abandoned a long time ago, General. With all due respect, I mean, we're not living in a country that has an honest press anymore. There are two things in play here. There was, number one, the folks were shocked. The regular folks were shocked by the pictures and that our soldiers could be this brutal toward these Iraqis, bad guys or not. The second thing was that the New York Times and the left-wing media used Abu Ghraib to humiliate the Bush administration. O'REILLY: To say, "See, the Bush administration is out of control, can't control it. Their callousness has filtered down, and it's Bush's fault." That's what it was. SANCHEZ: Well, to a large extent, you're absolutely right, because that is reflected in some of the questioning and some, obviously, in the press reports that occurred during that period of time. I believe that, in fact, we create the strategic defeat for America to a large extent by the way that we cover it in the press. Now, I'm not trying to demean whatsoever or walk away from the fact that some abuses do occur. But America is America. And we are very aggressive at addressing these and ensuring that we put the mechanisms into place to prevent them. O'REILLY: But still to this day they're saying, "Sanchez and Karpinski, they knew about it. And it was their, you know, they made it happen. They covered it up." You hear that all the time, do you not? O'REILLY: So how do you react to that? SANCHEZ: Well, you know, there's no way that I can defend myself against that, that extreme element. And what I try to do is just present the facts. The facts are that we were being very aggressive. We were investigating. We were holding our troops accountable. We were being pretty aggressive in implementing those safeguards and oversight mechanisms. And we are in Iraq, in fact, in compliance with the Geneva Convention. O'REILLY: Last question for you: Most Americans have had it with Iraq. They've had it. You can understand that. O'REILLY: I've had it with Iraq. But I understand the strategic importance vis-a-vis Iran. But two out of the three presidential candidates basically are going to take our people out of there, so they say. Is that a disaster, in your way of thinking? SANCHEZ: Pulling out of there unilaterally and precipitously will, in fact, create a significant national vulnerability and probably will put the entire region at risk. I don't believe that we can afford to do that. I believe we have a responsibility, having gone into that country and changed that regime. O'REILLY: But how much pain do we have to absorb? How much blood and treasure do we have to spend when the GAO says the Iraqi government is corrupt, and they're stealing billions from us? SANCHEZ: Well, I think we have to hold the Iraqi government accountable and begin, and force them to begin to take on some of those fiscal responsibilities and begin to pay for some of these initiatives. 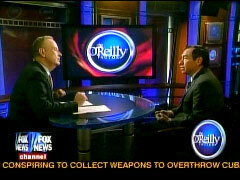 O'REILLY: So you do believe the Iraqis should pay for some of these? SANCHEZ: Oh, absolutely. Absolutely. They should have started paying for it a long time ago. O'REILLY: General, we appreciate you coming on in here. The book, again, is Wiser in Battle: A Soldier's Story. Thanks, General.